"Now they've killed. For that they must be killed. It has to be done before we start a stone rolling that'll gather enough poison moss to kill us all!" 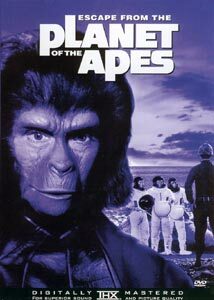 Perhaps the most sentimental, most 70's, most conventional, and most outrageous of the whole series, Escape from the Planet of the Apes is a near hilarious laugh riot turned paranoid sci-fi storyline. This episode is a treasure, a jewel that differentiates itself from the rest of the series by turning in upon itself and having some good, campy fun. When a space capsule (Taylor's, we learn later) splashes down in the ocean and is beached via naval helicopter, the welcoming committee of naval officers receives the surprise of their lives when the three astronauts they come to greet turn out to be the apes (or Ape-o-nauts) Dr. Zira (Kim Hunter), Cornelius (Roddy McDowall) and Milo (Sal Mineo). From the comical tests Dr. Lewis Dixon (Bradford Dillman) gives the amused Zira, who quickly cannot help but reveal their secrets (speech and rational thought), what follows is an absolute laugh riot, as the chimps (minus one, as Mineo's Milo meets an untimely death) must prove themselves also to a Presidential inquiry (reflecting the tribunal of orangutans Taylor went before in the original), the press and the rest of America. Soon they are delivered to dinner parties with witty repartee, waited upon at clothing stores, and booked into a lavish hotel suite, where Zira soothes herself in the "very wet" bubble bath, and the pajama-clad Cornelius watches their every movement retold on the evening news. Our two distinguished members of the ape intelligentsia have now been retrofitted into Mr. And Mrs. White-Middle-Class-Suburban-America. Diabolically comical! "What kind of upside-down world is this?" asked Taylor in the first installment, but he never experienced anything like this! The film soon turns dark, as is the series signature (and you have to respect this in this day and age of focus groups and rejected unhappy endings), when Dr. Hasslein (Eric Braeden) begins to probe Zira after plying her with "Grape Juice Plus" (wine), and she tells nearly the whole truth about the Earth's and Mankind's future. When he discovers Zira's pregnancy, he leads the right wing crowd to call for the abortion of the baby. What follows is your typical, paranoid sci-fi, cold war fare, but it works despite its predictability. Besides, with walk-on roles by Sal Mineo (Milo), M. Emmet Walsh (police captain) and Ricardo Montalban (circus master)—even now Variety columnist Army Archerd (referee) gets in the act—a little convention never felt so original come ANY 3rd installment in ANY other film franchise (I'm contemplating Indy, give it some time). If this film has a major flaw it is in its direction. I could live with the overly 70's feel of the musical score (one feels one could be watching Mod Squad or Mission Impossible) and the colorfully outlandish dress of the times (well, maybe not), but the quick, Batman-like transitions are just too like commercial television. Still, this is a treasure trove of witticisms and role reversal (within role reversal), that is one heck of a hoot when you boil it down. Now talk about your Court TV! Image Transfer Review: This is one amazing image. Anamorphic or not (NOT), this is a beautifully rendered transfer, with excellent color timing and detail (see the reflection of water on the naval boat as Dr. Hasslein lurks on deck), and a lack of evident scan lines, dirt or scars. Near perfect. Audio Transfer Review: It's funny as the series progresses and becomes more "modern" chronologically speaking, the audio transfers get more simple. This edition comes with a yeoman-like mono mix (English and French), which is adequate, serving its purpose well enough. Without as many special effects, a 2.0 or 5.1 mix really isn't necessary, but the strength of the front sound stage when called upon (helicopters, speeding cars) is rather surprising. Extras Review: Well, as with the audio transfers, the supplements per disc (forgetting for now the supplemental-rich 6th disc) becomes fewer as well. Subtitling (below the image, in the lower black bar) is available in English and French. Trailers for all 5 films are again present. Another even shorter cast list is given as well. No photo gallery was even included here. If you haven't seen this installment, or haven't seen it in a long time as it was with me, do yourself a favor and don't stop after the first two, or skip to the final two in the series. While Fox probably figured once broken out this film would not sell as well as some of the others (and it may not) thus the lesser transfers and extras, it is well worth your time and monetary investment. Whether you watch in order as I have or not, this flick is a real treat.